Good Friday morning all, I have another fantastic ladies leather jacket for me to showcase for you today. This particular jacket is a very high quality jacket that has really beautiful grommets with lacing for a stylish look makes it well put together. As you can see above this is a ladies fashion motorcycle jacket made from premium naked leather. This jacket has an action back with stretch panel in arms for comfort while riding. 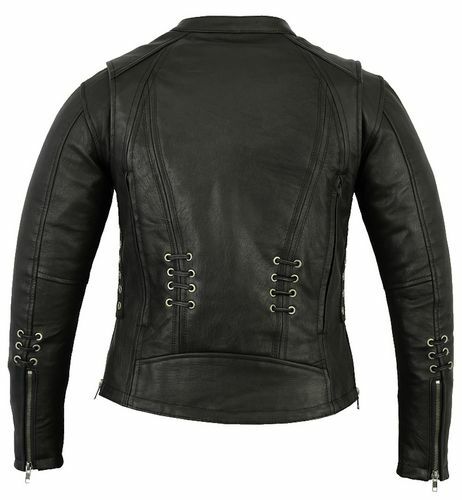 For a ladies stylish leather motorcycle jacket it has a lot of other features. For a jacket that is popular among the lady riders it also has 2 inside concealed gun pockets with elastic holsters and snap closure. That can hold your pistol close to you while riding, it also has 2 front hand pockets with wallet pocket system for more space. Plus one more inside pocket with wire feed system. This jacket also allows you to breathe well while your riding with 2 front and 2 back vents. It also contains zippers on each sleeve for adjustment and comfort. Side zippers as well for a better fit and movement, which is form fitting and snug to the body. On the inside, you will find a warm zip out full sleeve insulated liner that goes throughout both of the sleeves for added protection a zipper on each sleeve for adjustment and comfort. The zip out lining basically lays on top of the mesh lining and the leather itself to work against the weather. The sleeves also include lace for added touch of style. This particular ladies stylish leather lace motorcycle jacket is top notch quality and you can’t go wrong going with this kind of jacket. It has a lot of features and elegance, it is also a perfect option if you are looking for a perfect gift for that biker woman in your life. So if you are interested in this ladies stylish leather motorcycle jacket, please go ahead and check it out now, you will be glad you did! Happy Holidays and Shopping from all of us here at Leather Supreme!! 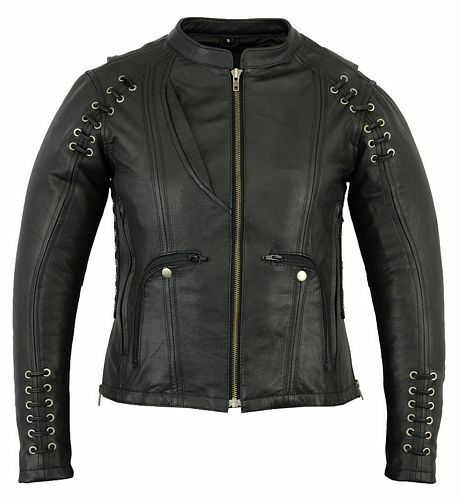 Click here to see this ladies stylish leather jacket now!! Previous post: Last Day For Black Friday Weekend Sales!